The Klang+Ton editorial office had many request for mini monitors with top sound that are still affordable. Looking for reasonably priced and proven drivers the Visaton SC 10 N8 tweeter with 8 Ohm and the Visaton W100 S4 bass driver with 4 Ohm came across. "After connecting and turning on the system, the size of the speakers became irrelevant. In our relatively large listening room the bass was certainly not overpowering, but still has genuine low bass qualities. The W 100 S performed at a happy medium between the direct approach of untreated paper cones and pleasant warmth â€“ and in addition there is, as already mentioned, quite a bit of bottom end. 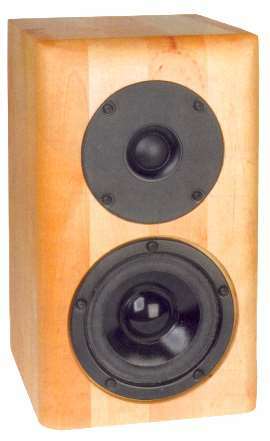 With the speakers placed parallel to the side walls the exaggeration at 10 kHz is not necessarily unpleasant but also not particularly well balanced. Angled towards the listener it was perfect: the transition from mids and tops was not audible, while the entire upper frequency spectrum was airy and transparent. Three-dimensionality is splendid: individual instruments as well as ensembles are placed with pin-point accuracy. Within limits, the CT241 doesn't even lose control playing back very dynamic music material and shows lots of spirit and an audiophile touch." Upon request, the CT241 is also available with higher grade components. Since an ELCO's value changes over time, it was replaced with an MKP capacitor, the coils are backed varnish and in series to the tweeter a Jantzen Z-CAP Supreme. All other components are the same as in the standard kit (see above).